Cape Coral is one the more relaxed and affordable communities in south Florida. Located just north of Ft. Myers and west of North Ft.Myers, it is between the Caloosahatchee River and the Gulf of Mexico. Cape Coral is a very new town; it was formed in 1958. The population is about 165,000, an increase of over 45% since 2000. It has a long coast line and many beaches to choose from. Nearby islands have additional beaches. One of the most unusual things about Cape Coral is its access to the water, since it is surrounded by it on 2 sides. It also has more than 400 miles of canals; thousands of people live on a canal with their boat docked beside their home. The cost of living and crime rate is lower than average. Nearby Fort Myers offers considerable shopping, recreation, cultural, and transportation opportunities. Many active adult communities are available in Cape Coral and surrounding towns. (Try asking the Chamber of Commerce in each town for a list). The median home value was $226,000 in late 2018, according to Zillow.com. During the third quarter of 2018, the National Association of Realtors reports the median sale price in the Cape Coral-Fort Myers area to be $250,000. With more than 400 miles of canals, Cape Coral has more canals than any place on earth. 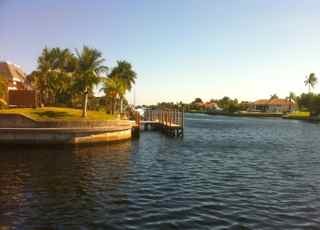 Cape Coral's access to the water and Gulf are extraordinary. Pine Island is nice place to live or visit. The Cape Coral Art Festival is one of the biggest in Florida. Warm winters. The real estate bust has hit Cape Coral and some of its neighborhoods and developments hard. Traffic in the winter season can be a bear. Summers are hot and humid. Cape Coral is surrounded by the Caloosahatchee River on the south and the Gulf of Mexico on the west. It is in southwest Florida. There is a huge island to its west, Pine Island. There are many bays, sounds, and harbors in the area. Winters are warm in Cape Coral, summers are hot and humid with daily rainstorms. The Cape Coral Festival of the Arts is held the second weekend of January every year. More than 100,000 people and over 300 artists and crafts people exhibit. Cape Coral Gardens is a popular attraction. 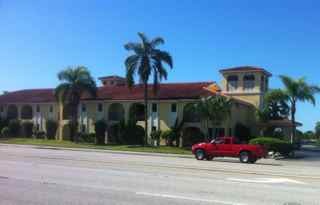 Nearby Ft. Myers has many theatres and cultural attractions including the continuing schedule at the Barbara Mann Hall. Crime in Cape Coral is just under the national average. Cape Coral Hospital is in town, while Ft. Myers has several large hospitals. There are qualified doctors for every kind of medical specialty in the Cape Coral area. Southwest Florida International airport in south Ft. Myers is nearby and one of the busier airports in the country.